This series of articles is intended to help court reporting students or working reporters/captioners/CART providers in the never ending quest to find the ultimate CAT software. In an effort to help with that quest, I have contacted working professionals in the field (not just (non-reporting) trainers) and asked them to tell you (yes, you!) why they use the CAT software they use -- their likes, dislikes, etc. ... and I managed to convince Kathryn "Do-it-Yourself-Shim" Thomas to write the digitalCAT article. Hello. I'm Kathryn A. Thomas, RMR. You may remember me from articles such as "Do-it-Yourself Shim" and the fabulous blog, Stenoray's Continual Quest. I'm a freelance CART provider/deposition reporter in the St. Louis area (including the Illinois side of the river). DISCLAIMER: I am not an employee of Stenovations, nor have I received any compensation from them for writing this article. I am, however, a long-term customer and a rabid fan of the company and their products. Just sayin'. Splash screen. I include it because Phil Stillerman included it in his CAT article. Those are my dogs Rutabaga and Lucy. Stenovations! DigitalCAT! What's their software like? First, it has a 90-day free trial of their full software. So really, you don't have to take my word for any of this, but see for yourself. If you like it, you can buy it or lease it for $79 a month, nothing down. AND THERE'S NO FREAKING SECURITY DONGLE. I've produced transcripts and CART on DigitalCAT for probably five years now, by my estimation. (Well, transcripts for five years. CART only about a year and a half.) I say with no hesitation or uncertainty that DigitalCAT is a rock-solid program, and I learned it quickly and easily. I should mention here that included in DigitalCAT are ready-made keyboard maps that you can load, so you don't have to learn all-new QuickKeys or TurboKeys or whatever the heck your current software calls them. And you can change them around if you want. Stenovations will even convert your dictionary for you. And your transcript file itself can be saved in numerous formats, .txt., Word, Summation, .rtf, .pdf (go to the Stenovations website to download an add-on which will let you save your transcript in .pdf), blah blah blah. Condensed and word index also available, but I think every CAT software can make a condensed transcript and indices nowadays. Vista? O_o I wouldn't know. 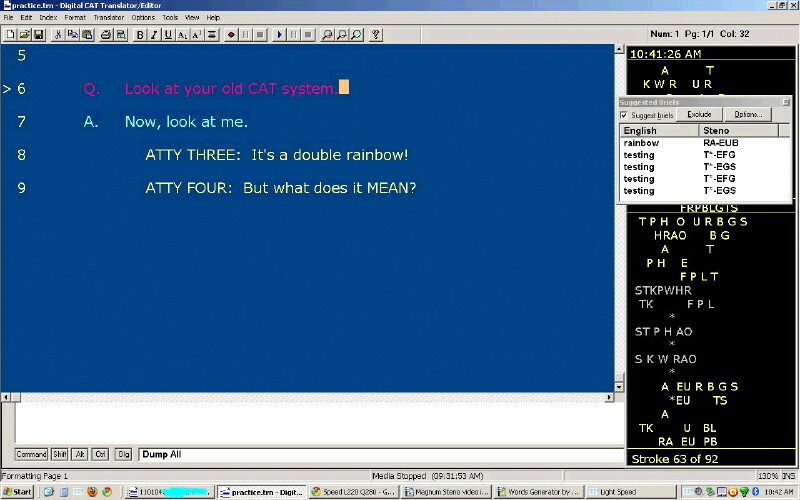 I have used DigitalCAT with Windows ME (don't judge me), XP, and 7 and have had no problems. Also, you can edit from your steno keyboard and create macros. The audio synchronization is great. Now, the audio isn't a .wav file, so I don't think you can import audio from a separate recorder, but I've never had to do so. The audio is clear (which of course depends on your notebook's sound system) and the file doesn't take up much hard drive space. I haven't looked at the owner's manuals for some time -- not that I'm one to read an owner's manual in the first place -- but it's available online as a .pdf download, as is the User's Guide. Folks, the support at Stenovations is fabulous. They've always been attentive and have ALWAYS solved my problem. ALWAYS. (Not that I've had many problems, mind you.) Problems will happen with ANY CAT software, but when they have happened, they've been resolved quickly. I had a bit of trouble writing this section, mostly because I don't do captioning (yet), nor did I even know what to look for in a captioning suite even if I WAS looking to upgrade to one. 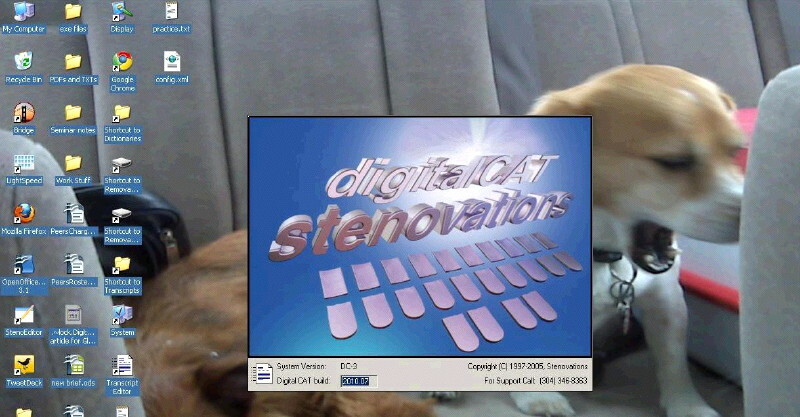 But here's what I CAN tell you about DigitalCAT's captioning program: Our own lovely and talented Mark "Magnum Steno" Kislingbury helped design it, and he says, "It's simple, no frills, easy to use, and does what I need. And it's cheaper than the others." Bam. That's good enough for me! I've been with Stenovations for several years now, and not once have they sprung the ol' buy-our-software-now-and-three-months-later-introduce-an-entirely-new-software-that-you-can't-upgrade-to trick. Johnny Jackson was himself a reporter. He knows what's needed. And the guy has ideas. Go find him at the next convention and ask about them. It's like talking to Richard Branson or Steve Jobs, the innovations he's wanting to work on. And do talk to the tech support guys; there's usually one or two at the booth. They listen (and tell them I sent you!). Now, I'm not saying any of the other CAT vendors don't listen; I'm just saying Stenovations does. My only other experience with a CAT company was Cheetah's TurboCAT back in the day, so I can't speak of any other CAT companies.